Conceiving a child becomes more difficult as we get older as fertility decreases with age. This is particularly true for women who rely heavily on several factors to conceive: reproductive system health, number and quality of eggs and levels of hormones that favor fertility and conception. What is interesting is that female fertility with all it implies is largely dependent on good nutrition, more exactly meeting the daily requirements of several essential vitamins and dietary minerals. Certain aspects of male fertility are also deeply impacted by good nutrition. And while we need to get all 26 essential vitamins and dietary minerals and several other different types of nutrients every day to lead a long and healthy life, making sure we have enough or more of 7 of those essential nutrients when looking to have a child can increase our chances of conceiving by improving fertility. As always, it would be ideal to get all the nutrients we need on a daily basis from food. However, this is not always possible despite our best efforts. First of all, food is not as nutritious as it used to be as excessive use of pesticides or chemical fertilizers, pollution, aggressive agricultural practices that deplete soils of their nutrients and do not allow them to replenish themselves etc. have lead to great differences in the nutritional value of our food, making it often less nutritious than it used to be (except, of course, for crops especially engineered to have a higher content of certain nutrients, such as yellow rice). 1) Folic acid. 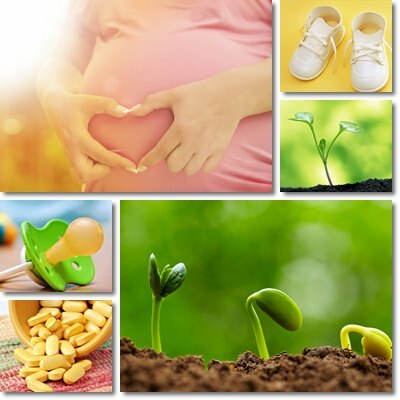 Vitamin B9 or folic acid is known to support fetal development during pregnancy, prevent premature labor and neural tube defects which are severe birth defects in the form of openings in the spine or brain of the newborn baby or missing portions of brain. These birth defects are serious and often cause paralysis, blindness, deafness or death of the infant. Research has revealed that supplementation with vitamin B9 is vital during pregnancy, but also before it. Experts recommend women looking to conceive take folic acid before conception and continue throughout the pregnancy to prevent such defects (Folic Acid Supplementation and Pregnancy: More Than Just Neural Tube Defect Prevention). During the pregnancy, folic acid helps with normal fetal development through DNA and RNA synthesis and production of new cells. Taken before conceiving, the vitamin helps the mother stay healthy which is vital because the health of the future baby is dependent on the mother’s good health. A severe folic acid deficiency in an adult woman can cause a variety of more or less serious health issues (example: nerve damage) and it takes time to correct it. When the mother doesn’t get enough folic acid, neither does her baby. And if the mother-to-be starts off deficient in the vitamin, the baby will most likely suffer as a result of the deficiency. 2) Vitamin B12. The nutrient has been shown to support both male and female fertility. In women, vitamin B12 supports ovulation and helps with egg fertilization and implementation in the uterus lining (this marks the beginning of the pregnancy). The vitamin is also required to successfully carry the pregnancy to term, contributing to fetal development. In men, a deficit of the vitamin causes low motillity and low count of reproductive cells. A severe shortage has been linked with both female and male infertility, miscarriage and stillbirth. In pregnancy. Research suggests vitamin B12 is vital for normal DNA synthesis and neurological development. A deficiency increases the risks for neural tube defects and neurological damage in newborns. Again, if the mother is deficient before conception, chances are the fetus will also suffer from a B12 deficiency either because she may not know and the deficiency risks remaining uncorrected or because it takes time to correct it, again, exposing the fetus to a shortage of the nutrient. 3) Vitamin C. Vitamin C helps maintain hormonal balance, directly improving female fertility. The nutrient is believed to be particularly efficient in regulating levels of progesterone, one of the two principal female hormones required for conception. Research suggests the nutrient is involved in the development of the corpus luteum, a structure that secretes progesterone and makes it possible for the pregnancy to develop. Moreover, vitamin C appears accumulates in both female and male reproductive organs, protecting against free radicals and subsequent DNA damage that may result in defects leading to pregnancy loss and chromosome abnormalities. In addition to this, the nutrient is believed to help repair tissue, indirectly supporting reproductive system health and fertility (Ascorbic acid and fertility). Lastly, supplementation with ascorbic acid has been shown to be an effective therapy to improve fertility and increase pregnancy rate in women who do not smoke (Ascorbic acid and infertility treatment). 4) Vitamin D. Vitamin D receptors can be found throughout our body, including in the uterus, ovaries and placenta, where the nutrient is believed to bind to the receptors and exert various functions that directly impact fertility. Research suggests that vitamin D stimulates the production of both estrogen and progesterone, the two principal female hormones, contributing to maintaining hormonal balance and encouraging ovulation, a key element for female fertility. Moreover, multiple studies assessing the rates of in vitro fertilization in women experiencing difficulties conceiving have shown that higher vitamin D levels contribute to higher pregnancy rates. Animal studies also show reduced fertility as a result of vitamin D deficiency in both male and female rats. Lastly, vitamin D deficiency in pregnant women is believed to result in pregnancy complications such as infections, gestational diabetes, preeclampsia or premature labor and miscarriage, but also asthma, low birth weight, low bone density, rickets etc. in babies (Vitamin D and fertility: a systematic review). 5) Vitamin E. Vitamin E is a fat-soluble antioxidant nutrient that accumulates in cell membranes throughout our body. A sufficient intake is believed to help boost both female and male fertility as a result of its excellent antioxidant action, reducing free radical damage in both female and male reproductive cells. It is particularly beneficial for men because it helps improve motility and thus aid with conception. Studies suggest that vitamin E may also help women with unexplained infertility achieve pregnancy by increasing the thickness of the uterine lining (the endometrium may be too thin to support a pregnancy) and reduce miscarriage rates (Vitamin E effect on controlled ovarian stimulation of unexplained infertile women). 6) Selenium. Together with vitamin E, selenium is an essential nutrient for male fertility, improving motility and helping achieve pregnancy. Supplementation with the mineral has been shown to reverse infertility in male with selenium deficiency. As a result of its antioxidant action, the nutrient also protects egg cells from free radical damage that may result in failed conception, miscarriage or chromosone abnormalities causing birth defects. 7) Zinc. The dietary mineral is physically present in both female and male reproductive systems and a severe deficiency has been correlated with both female and male infertility. In men, zinc aids fertility by improving the number and quality of reproductive cells. In women, zinc favors the implantation of the fertilized egg cell in the uterus wall and helps carry the pregnancy to term. It has been theorized that the body sends zinc from the blood serum to the immature egg cell in view of supporting fertilization and pregnancy development. A significant shortage of the nutrient has been identified in women who have experienced early miscarriages and in women with reduced fertility who seek in vitro fertilization, further reinforcing the need of having a sufficient intake of the mineral. Other types of nutrients that further contribute to reproductive system health and higher pregnancy rates are Coenzyme Q10, lutein and essential fatty acids (Omega-3 especially). Their action aims at offering antioxidant protection to cells, reducing free radical damage, maintaining hormonal balance and reproductive system health. Research also points at the role of lutein which is physically present in the corpus luteum, an organ involved in the production of progesterone in view of supporting pregnancy. Conclusion. While it is true that an insufficient intake of any of these 7 vitamins and minerals that boost fertility can result in inability to conceive, miscarriage and low pregnancy rates, it is important that we understand that all essential nutrients work closely together in order to ensure good health. Not getting enough of one vitamin or one dietary mineral can impact another and its functions, potentially compromising good health with all it stands for, fertility included.